Let’s start this week off right. With lots of sugar. And butter. The only way to go this time of the year. Because it’s the holiday baking season and I can’t seem to stay out of my kitchen and away from my baking sheets and mixer. As you can probably tell, I am totally utterly completely in the holiday spirit and have so many fun recipes that I can’t wait to share with you. But we’re going to first focus on these cranberry cupcakes with white chocolate frosting. And boy are they good. My husband called them “exotic” cupcakes … which I found slightly entertaining. Although I’m pretty sure he thinks anything that is not vanilla bean is exotic. Hmmm. So, these cupcakes. They are light and fluffy with little burst of tartness from the fresh cranberries. And the frosting. My my the frosting. It tastes like straight up white chocolate. In fluffy frosting goodness that compliments the cranberries and orange perfectly. It is on the sweeter side so you really don’t need a whole lot on each cupcake. Or you can just ignore that fact and do what I did and slather plenty on each while dancing around the kitchen singing Christmas songs at the top of your lungs. No judgment. 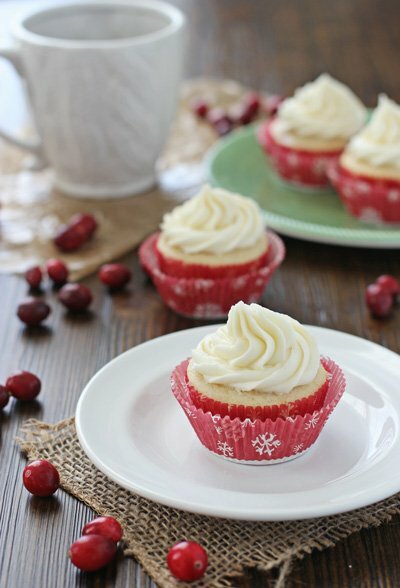 Recipe for cranberry cupcakes with white chocolate frosting. Vanilla cupcakes filled with fresh cranberries and orange, complimented by a decadent frosting. To make the cupcakes – preheat the oven to 350 degrees. Line cupcake pans with liners and set aside. In a medium bowl, sift together the cake flour, baking powder, salt and cinnamon. In another medium bowl, whisk together the buttermilk and egg whites. In the bowl of a stand mixer fitted with the paddle attachment, add the granulated sugar and orange zest. Rub the mixture together with your fingers until the sugar is moist and fragrant. Add the butter to the bowl. Beat on medium speed for 3 minutes, until it is very light. Add in the vanilla and almond extracts and beat until incorporated. With the mixer on low speed, add in one third of the flour mixture. Next, add in half of the buttermilk mixture, beating until incorporated. Repeat this process, one third flour mixture, remaining half buttermilk mixture. Finally add in the remaining third of the flour mixture. Once incorporated, increase the speed to medium low and beat for 2 minutes, to ensure it is well aerated. Remove the bowl from the mixer. Toss together the chopped cranberries and 1 tablespoon sugar in a small bowl. Gently fold the cranberries into the batter. Fill the prepared cupcake tins evenly with the batter (about ⅔ of the way full). Bake for about 18 minutes, or until a toothpick inserted into the middle comes out clean. Let the cupcakes cool for about 5 minutes in the pan, then remove to a wire rack to cool completely before frosting. To make the frosting – add the butter to the bowl of a stand mixer fitted with the paddle attachment. Beat on medium speed until light and fluffy, about 1 to 2 minutes. Add in the vanilla and beat until combined. With the mixer on low speed, slowly add in the confectioners’ sugar, about ½ cup at a time, beating after each addition until combined. Once all the sugar is incorporated, pour in the cooled melted white chocolate. Beat on medium speed until well combined. Add in the milk and beat on medium until the frosting is light and fluffy. If the frosting is not thick enough, slowly add in additional confectioners’ sugar until it reaches your desired consistency. *Make sure that you use good quality white chocolate, like Ghirardelli or Callebaut. Do not use white chocolate chips or candy melts, etc. Cupcake base adapted from my favorite vanilla bean cupcakes, which were originally from Baking: From My Home to Yours. Frosting slightly adapted from How Sweet Eats.